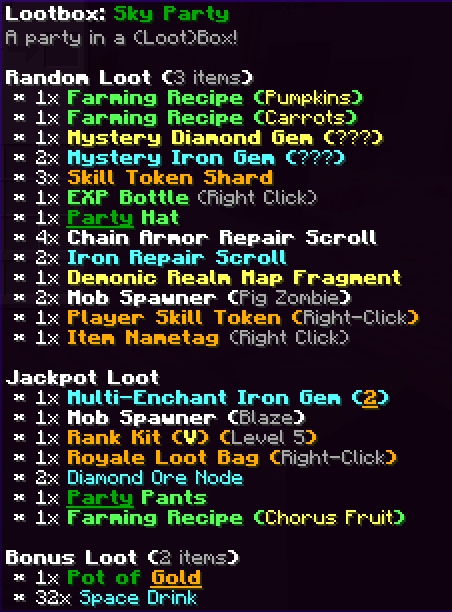 Just when you thought Chorus Fruit was the last mission to tackle for your /is farming, here we are with the next level- Custom Recipes! Custom recipes are a brand new, unique system to revolutionize your island. This isn't just a simple grow and sell - there are multiple crafting steps needed to create these new custom recipes, as well as higher Island requirements. However, you're going reap the rewards, not only financially, but by being the envy of all the other islands if you're the first to get this. Run /is recipes in-game to see what ones are available! Custom recipes are typically multi-staged - so you're going to need to craft one custom item to be able to craft the main custom item to sell. The recipes themselves are not going to be easy to find, but the hunt will be worth it! Crafted using regular Chorus Fruit and Poisonous Potatoes, this is a high tier product that sells for a pretty penny. To craft poisonous potatoes, simply add 32x potatoes and 16x coal into your crafting window! 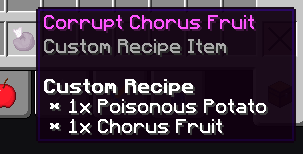 You're then going to need to grab yourself a Corrupt Chorus Fruit recipe. Corrupt Chorus Fruit sells for $10,000 each! In celebration for St. Patricks Day on Sunday, we've got our own party in a (loot)box for this weekend only! Sporting some of the most coveted items in the game, as well as a little bit of fizzy pop to get us in the mood, this week's Lootbox is guaranteed to get us giddy with joy (and Space Drinks!). So what's inside... ? CosmicSky came out of beta and was released to the public! Pistons were given limitations to the amount of piston pushes per chunk, per second. To celebrate the luck of the Irish, we're giving you your own luck with a whopping 25% OFF sale across our whole server store! Grab what you can now because this sale is only going to last the weekend. To craft poisonous potatoes, simply add 32x potatoes and 16x into your crafting window! gg! Carrots are now fixed! Time to get wast...... I mean hydrated!!!!!! Custom recipes seem like an awful lot of work for not that much reward.